While the table ale has been trending in the right direction, it is still a work in progress. Batch #1 was underwhelming; lacking bitterness, carbonation, and depth of flavor. After making changes to the recipe, water chemistry, and mash/fermentation temperatures, batch #2 (tasting notes forthcoming) was more in line with my vision. However, despite improved bitterness, opacity, and flavor, there was still room for improvement. For the third incarnation of the table ale, my goal was to further suppress the yeast character to allow the hops to shine. 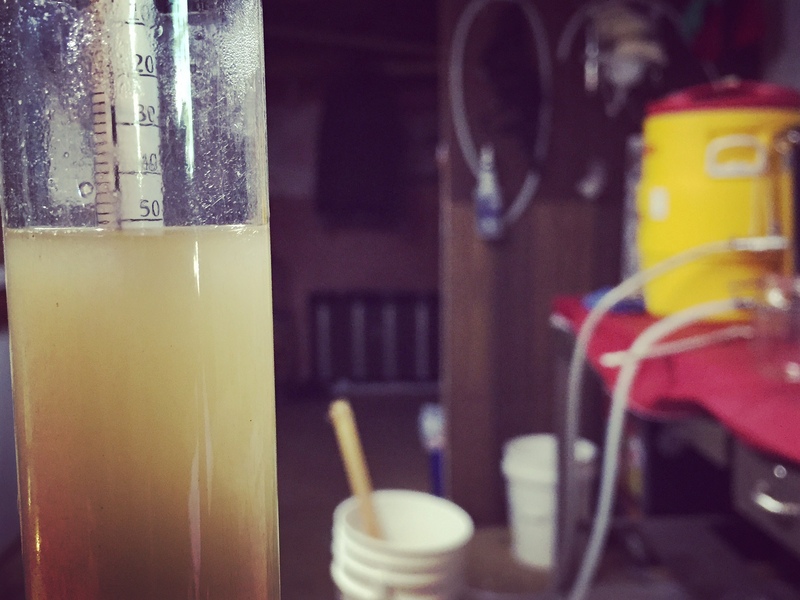 Specifically, I wanted to reduce the esters just enough to create distinctly different yeast characteristics between the table ale and farmhouse ale, despite using the same strain. Esters are fruity aromatic compounds produced by yeast. Common aromas include banana, apple, pear, and even (dreaded) nail polish! Esters are formed when yeast combine ethanol and organic acids in beer. Specifically, fatty acids (a subset of organic acids) are activated by combining with coenzyme-A to form acetyl coenzyme-A (ACoA). These activated acids interact with ethanol to form esters. The esterification is catalyzed by alcohol acetyl transferase (AAT). For this batch, I was unwilling to manipulate three factors; wort composition, yeast strain, and suspended solids. Wort composition was (nearly) identical to batch #2, containing 1/3 adjuncts (wheat and oats). Besides providing a beautiful haze to the beer, the presence of the adjuncts also reduces free amino acid levels and therefore esters. Additionally, I was unwilling to swap yeast strains, as I am committed to using the house yeast (foraged yeast #1) for the foreseeable future. Lastly, due to my electric brewery system, suspended solids are more or less constant from batch to batch. I did, however, manipulate the four remaining factors; wort aeration, fermentor geometry, pitching rate, and temperature. Unlike previous batches, I properly aerated the wort with 60-90 seconds of pure oxygen. Additionally, fermentation occurred at a fermentor height/width ratio of 9.75/10.5, an increase of 95% over previous batches. Yeast was intentionally over pitched at a rate of 11.2 billion cells/ml as opposed to the recommended 7.4 billion cells/ml. Lastly, fermentation temperature was kept below 68°F (5°F less than batch #1. The combination of these four changes will hopefully reduce ester levels in the final beer! Notes: Brewed solo on 6/12/2016. pH readings were 5.24/5.37/5.68/5.53/5.41 (mash/2nd run/3rd run/preboil/postboil). Undershot target mash temperature (160°F) which resulted in higher than expected mash efficiency. Preboil, 1 gallon (@ 180°F) was pulled for the Raw Table Ale and 1 gallon (@ boil) for the Seawater Gose. Postboil, 1 gallon was reserved for Evolution #1 and 2.5 gallons was diverted into five growlers for Foraged Yeast Pilot Batch #2. 4.5 gallons was oxygenated and fermented with house yeast, 2.5 gallons of which is earmarked for Foraged Yeast Pilot Batch #3. 6/12/2016 – Raw Table Ale pitched with house yeast. Seawater Gose incubated at 95°F with Foraged Bacteria #2 and #5. Evolution #1 was pitched with lees from Farm Bière. 6/13/2016 – Raw Table Ale showing signs of fermentation. Evolution #1, Foraged Yeast #16, Foraged Yeast #17, actively fermenting. Seawater Gose down to 3.38 pH after 25 hours. Removed from heat source. Pitched house yeast the next morning at ambient temperatures. 6/16/2016 – Seawater Gose, Foraged Yeast #19, and Foraged Yeast #20 are actively fermenting. 6/19/2016 – Foraged Yeast #18 is fermenting. 6/21/2016 – Added 2.7 oz Rakau pellets for first dry hop (day 9). 7/10/2016 – Transferred Table Ale #3 to keg. Gravity down to 1.004. 7/24/2016 – Browned 3.5 g fresh coriander (0.125 oz/gal) in pot for a few minutes. Crushed coriander, then added 8 oz Atlantic seawater. Boiled to sterilize then added to taste (6 oz in 3.75 qts). Primed Gose to 3 volumes, Evolution #1 to 2.5 volumes, and Raw Table Ale to 3.5 volumes. 8/26/2016 – Tasting notes for the Table Ale. 11/30/2016 – Tasting notes for the Seawater Gose. 12/21/2016 – Tasting notes for Evolution #1.